DMP Enters into "Times Business Awards 2018!" 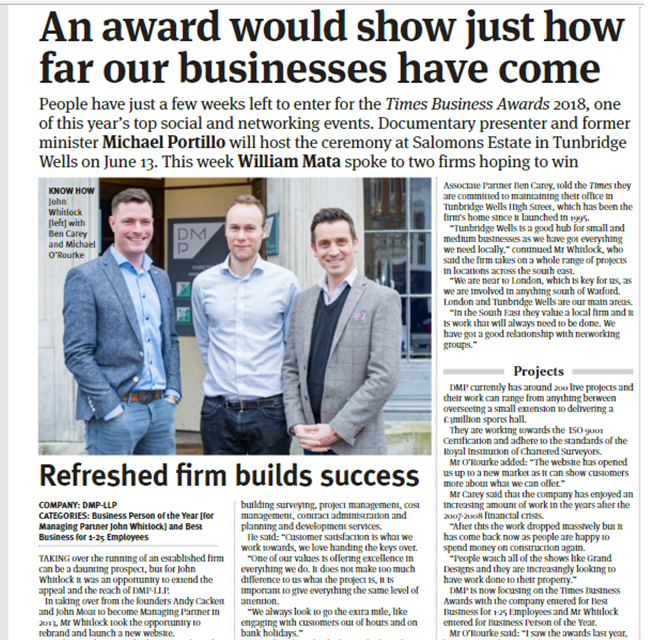 DMP is very excited to have entered into the Tunbridge Wells Times Business Awards 2018! We are waiting with anticipation to hear whether DMP have been short listed for two categories: Business Person of the Year (for John Whitlock) and Best Business for 1 - 25 Employees. This years event is being hosted by documentary presenter Michael Portillo at the wonderful Salomons Estate in Tunbridge Wells. DMP are hoping to be shortlisted for this prestigious award, and attend the gala dinner on June 13th. The Partners were interviewed this week for the Times of Tunbridge Wells. Read the full article page 8. Keep your fingers crossed for our nomination!